hybris Cockpit Framework Expert Customization Explained. Part I.
hybris Cockpit framework was introduced many years ago and now it is being decommissioned. 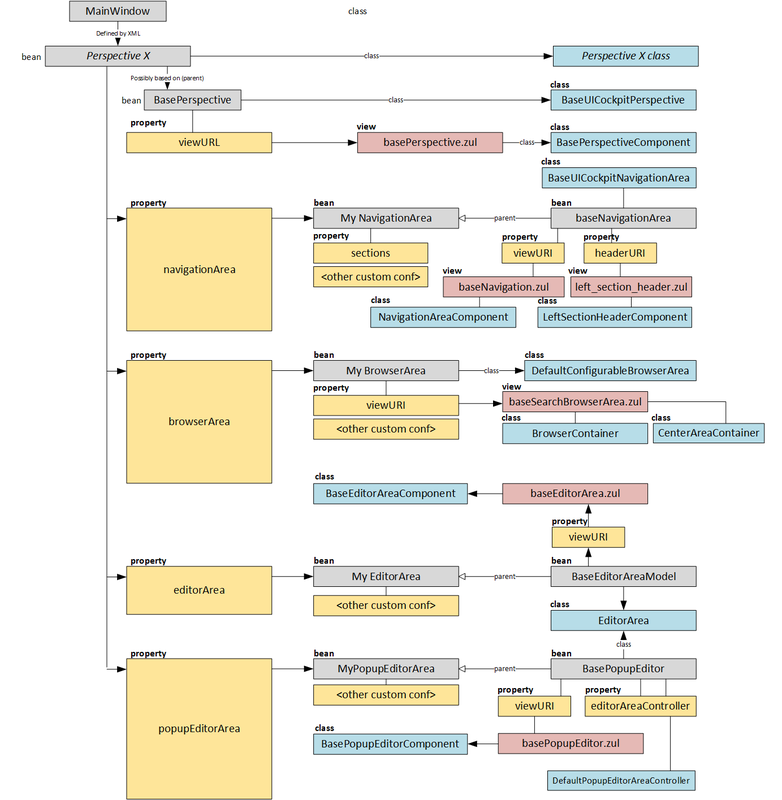 However, due to various reasons, new projects and almost all of the existing are actively using this framework for extending hybris cockpits. 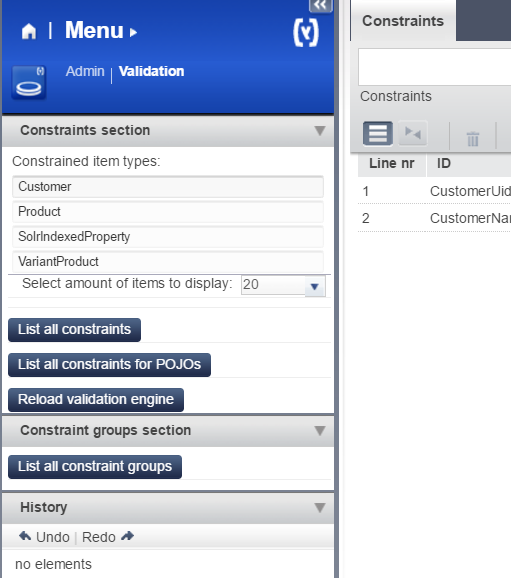 It is one of the most challenging areas in hybris, because the framework is underdocumented, the code is very old. This article will shed some light on the topic and make difficult things clearer. I hope that this information will become a good addition to the official documentation. The Hybris Cockpit framework is based on ZK Framework 3.6, a rich internet application framework that enables desktop-like GUIs within a web browser. The starting page of all cockpits is index.zul. Let’s start our journey with this file. The parameter “use” of the tag “window” defines an implementation of the component. For the main window the implementation class is de.hybris.platform.cockpit.components.impl.MainWindow. “Perspectives” are something like “tabs” in UI, but with a bit different look. Each perspective is based on the same page structure, if you use the built-in BasePerspectiveComponent. dragOverPerspectivesEnabled – you can drag the object over perspective name. Hybris will change the perspective to allow you to drop the object to the other perspective’s area. by default, dragOverPerspEnabled is false. Did you know that you can drag a product from the Product perspective to Catalog and link it to one of the categories? This parameters enables it. sendEventsImmendiately defines the event processing mode. If true, global events are pushed into perspective event handlers immediately. Otherwise, the event cache is used and there is a delay. There is one component defined in the perspective template, BasePerspectiveComponent. Below is an example from admincockpit that shows how new perspectives can be created. Note, that the bean ValidationNavigationArea extends BaseNavigationArea. For each bean you can specify the custom renderer. 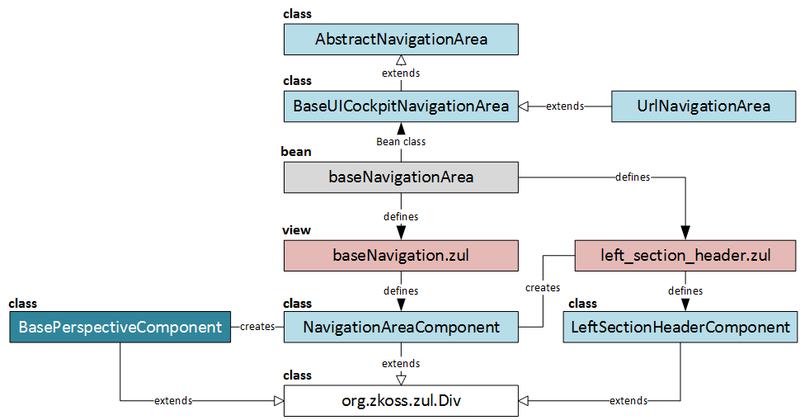 Create a new navigationArea bean with the custom implementation. See above for the example from admincockpit. 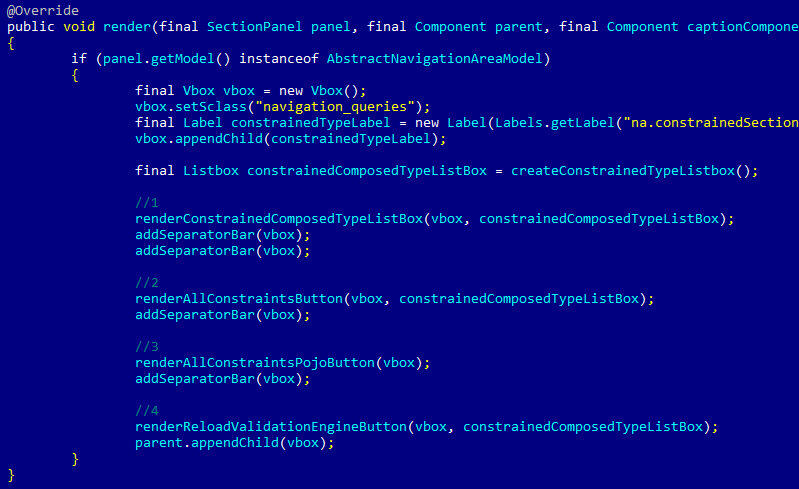 Redefine a Navigation Area component by extending NavigationAreaComponent. For each bean you can specify the custom renderer. For example, CSCockpit (deprecated now) uses three browsers: csTicketPoolBrowser, csBasketBrowser, csEndCallBrowser. defines a default browser from the list above. The value is a reference to a bean, not a real id. For example, for the example above, .
. You can specify a type to browse by default. “Product” means that the browserarea will display a list of products. 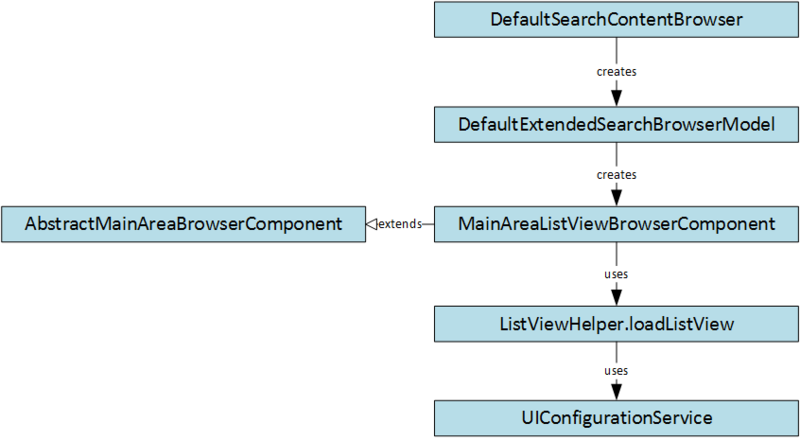 It is defined only in DefaultSearchBrowserArea. is a boolean parameter. 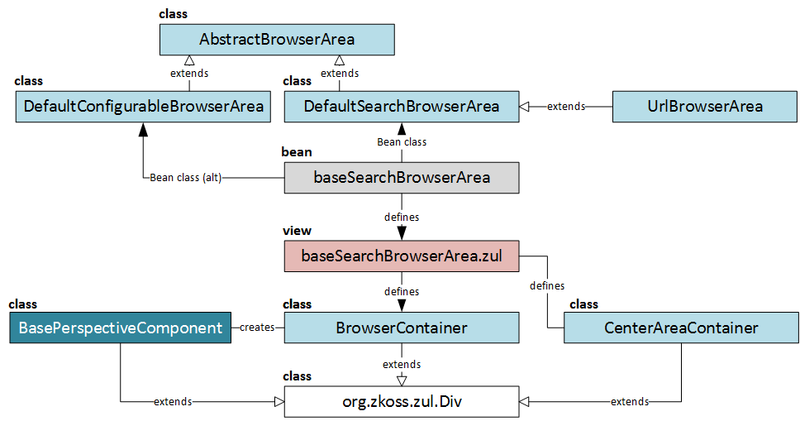 Defines what class should be used for the area, DefaultExtendedSearchBrowserModel or DefaultSearchBrowserModel. Browsers. These are basically tabs at the top of the area. You can create/remove tabs via browser. Caption component. According to QueryCaptionBrowserComponent, it contains query text box, search and advanced search buttons, save query button, advanced search related stuff, a split button. Toolbar component. By default, DefaultSearchContentBrowser defines toolbar component. DefaultExtendedSearchBrowserModel creates MainAreaListViewBrowserComponent by default. DefaultAdvancedContentBrowser creates MainAreaGridViewBrowserComponent by default. For example, valueChanged is triggered once you change the value of any item in the editor pane. To replace/extend the default Editor Area Listener, you need to add a parameter into XML configuration. Renderers are responsible for creating HTML code. If you need to inject something before or after the list of rows, you can extend the default renderer. However, it is not easy to inject something in the middle of the supplied code other than to rewrite that code completely. To change editors for different types, there is a separate configuration that tells cockpit framework what editor should be used for what type. The result will be that pencil icons will appear also for editor rows in popup editor area. Clicking the pencil icon will simulate next level and back button will appear on top. There are a big topic on how to operate wizards and popup windows created by ZK. This topic is for the next part. To sum up, in this article I explained the very basics of Cockpit Framework, perspectives, areas and their components, their architecture and customization approach. This is just the tip of the iceberg. I’ll come back soon with other topics about Cockpit Framework and expert customization. Stay tuned! have you had a chance to work with the new cockpit framework and backoffice? I would be very curious to see a comparison of the old framework against the new. Great article, Rauf! This kind of cockpit has a lot of customization options and unfortunately a not that good documentation (as you said). Great article Aliev! This kind of cockpit has a lot of customization options and unfortunately a not that good documentation (as you said).